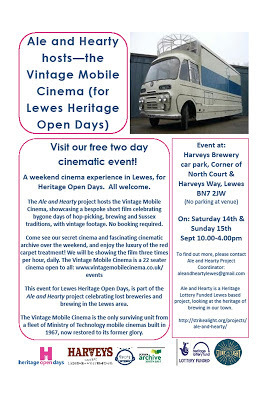 Ale & Hearty meets the Vintage Mobile Cinema at Harveys Brewery car park, corner of North Court and Harveys Way, Lewes, East Sussex, BN7 2JW. Times and dates are 10am-4pm, Saturday 14th and Sunday 15th September. The event is hosted by the Ale & Hearty project, celebrating lost breweries and brewing in the Lewes area, and is part of this year’s Lewes Heritage Open Days. The specially-made film will be around 17.5 minutes long and eulogises about bygone days of hop picking, brewing and local Sussex traditions with vintage footage taken from local sources including Screen Archive South East. The Vintage Mobile Cinema seats a maximum 22 people per tour/event. It is the only surviving unit from a fleet of seven Ministry of Technology mobile cinemas built in 1967. Meticulously restored to its former glory, it now features state-of-the-art surround sound, HD digital projection and a comfortable climate-controlled environment for the audience. This is a short event; the film will be shown three times every hour for a six-hour period during both days so is suitable for children from the age of 5 years who are easily bored. The cinema itself is a thing of beauty and of interest to everyone. Please note this event takes place outside in a working brewery car park so, although all necessary safety precautions have been taken, parents must be responsible for their children. Unfortunately, due to the age of the Vintage Mobile Cinema, there is no accessible provision for this event. The nearest municipal access toilet is on Market Lane, Lewes, BN7 2NT. Pay parking and disabled parking is available in the NCP Harveys Way car park, Lewes, BN7 2JW, which is next to the Harveys brewery venue. There is absolutely no parking available in Harveys Brewery car park. Pedestrians walk along Cliffe High Street, past the Harveys Brewery shop on your left, then take the little ‘twitten’ or alleyway, North Court, just afterwards, also on the left (with Bills restaurant on your right). Go through North Court and walk to the end. To the right there is a municipal car park, to your left is the back entry delivery park for Harveys Brewery for deliveries - the Vintage Mobile Cinema is in there. http://www.vintagemobilecinema.co.uk/events. No booking is required for this free event.